The journalist Alexander Somerville reported from inside the offices of the Anti Corn Law League. This is his account, published in 1843. 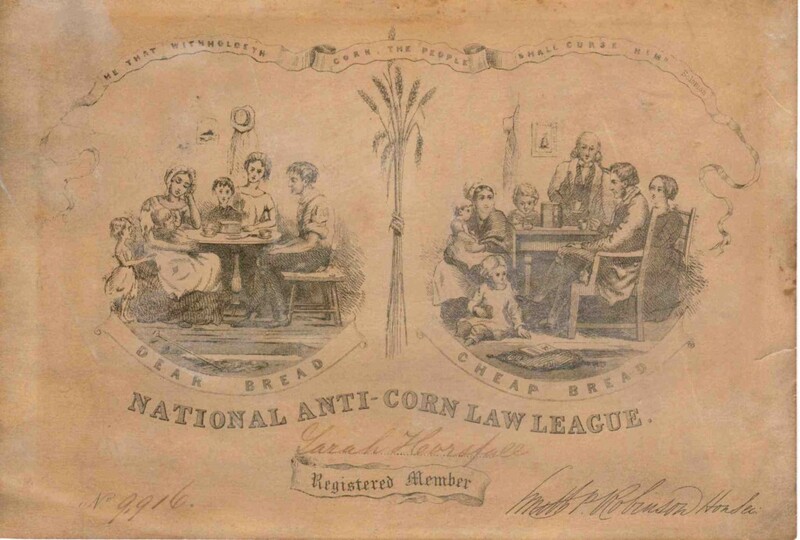 The Anti Corn Law League was one of the most successful political lobbying groups of the early Victorian era. The league was established by Richard Cobden, who in 1839 brought together campaigners in London and Manchester to demand the repeal of taxes on corn which subsidised farmers by penalising factory workers and their employers. With Cobden’s organisational skills and John Bright’s oratory, the campaign achieved its goal in 1846. The victory was as important for what it symbolised – the transfer of power from the landed aristocracy to industrialists – as for what it did. Almost as significantly, prime minister Robert Peel’s repeal of the corn laws helped create the modern Conservative Party by splitting the old Tory alliance. You can read more about the Anti Corn Law League and its relationship with Chartism at Chartist Ancestors. This account of a visit to the League’s headquarters is by Alexander Somerville, a sympathetic journalist. Accordingly at ten o’clock I was in Market Street, a principal thoroughfare in Manchester. A wide open stairway, with shops on each side of its entrance, rises from the level of the pavement, and lands on the first floor of a very extensive house called ‘Newall’s Buildings’. The house consists of four floors, all of which are occupied by the League, save the basement. We must, therefore, ascend the stair, which is wide enough to admit four or five persons walking abreast. On reaching a spacious landing, or lobby, we turn to the left, and, entering by a door, see a counter somewhere between forty and fifty feet in length, behind which several men and boys are busily employed, some registering letters in books, some keeping accounts, some folding and addressing newspapers, others going out with messages and parcels. This is the general office, and the number of persons here employed is, at the present time, ten. Beyond this is the Council Room, which, for the present, we shall leave behind and go up stairs to the second floor.Here we have a large room, probably forty feet by thirty, with a table in the centre running lengthwise, with seats around for a number of persons, who meet in the evenings, and who are called the ‘Manchester Committee’.”He goes on: “During the day this room is occupied by those who keep the account of cards issued and returned to and from all parts of the kingdom. A professional accountant is retained for this department, and a committee of members of council give him directions and inspect his books. These books are said to be very ingeniously arranged, so as to shew at a glance the value of the cards sent out, their value being represented by certain alphabetical letters and numbers, the names and residences of the parties to whom sent, the amounts of deficiencies of those returned and so on. Passing from this room we come to another, from which all the correspondence is issued. From this office letters to the amount of several thousands a-day go forth to all parts of the kingdom. While here, I saw letters addressed to all the foreign ambassadors, and all the mayors and provosts of corporate towns of the United Kingdom, inviting them to the great banquet which is to be given in the last week of this month … In this office copies of all the parliamentary registries of the kingdom are kept, so that any elector’s name and residence is at once found, and, if necessary, such elector is communicated with by letter or parcel of tracts, irrespective of the committees in his own district.Passing from this apartment, we see two or three small rooms, in which various committees of members of the council meet. Some of these committees are permanent, some temporary. Of those which are permanent I may name that for receiving all applications for lecturers and deputations to public meetings. … In another large room on this floor is the packing department. Here several men are at work making up bales of tracts, each weighing upwards of a hundred weight, and despatching them to all parts of the kingdom for distribution among the electors. From sixty to seventy of these bales are sent off in a week, that is, from three to three and a-half tons of arguments against the Corn Laws! Source: Whistler at the Plough by Alexander Somerville (Merlin Press, 1989).